Anke Nordemann-Schiffel is a specialist in the protection of industrial property rights. 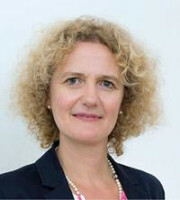 Dr Nordemann-Schiffel studied the science of law at the Universities of Paris 1 (Panthéon-Sorbonne), Goettingen and Munich. She subsequently earned her doctorate at the University of Munich, as a scholar in the ‘Arbeitskreis Wirtschaft und Recht’, on questions of German-French private international law. Dr Nordemann-Schiffel joined BOEHMERT & BOEHMERT in 1999. Her specialist areas include not only copyright, trademark, press and competition law, but also international law. In the trademark area, she coordinates international litigation and manages and coordinates extensive international portfolios. In the field of copyright law, she advises and represents large and small scientific and literary publishers and film companies. In addition, she advises extensively on matters regarding personal rights. Her clients further include companies in the food and cosmetics industries. Since 2010 Dr Nordemann-Schiffel has chaired the Berlin district group of the German Association for the Protection of Intellectual Property. In addition, she is a member of the Federal Chamber of Lawyers Industrial Property Rights Specialist Committee. She is additionally a member of the Specialist Committee on Industrial Property Rights of the Chamber of Lawyers of the State of Brandenburg. Apart from her activities as a lawyer, she teaches at Humboldt University in Berlin and regularly holds seminars for the German Lawyers Academy, such as the annual specialist course on copyright and media law with aspects of international law, and a course on publishing law. She is also a member of the board of the Ada and Emil Nolde Foundation.